Monday, August 24, 2015. Chaos and violence continue, militias strangle the hope in Iraq, the League of Righteous lies (but what else would they do), the United Nations notes the ongoing refugee crisis in Iraq, and much more. One image may capture better than any other a feeling many Iraqis have regarding the leadership in the country. 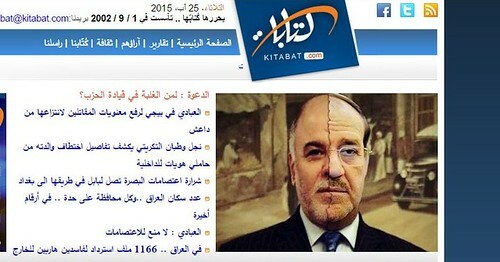 That's from the Kitabat website and 1/2 the face is current Iraqi Prime Minister Haider al-Abadi while the other half is former Prime Minister Nouri al-Maliki. The accompanying article argues that Iraq is witnessing the struggle between Haider and Nouri -- both Dawa Party members, following Haider's announcement that the Vice President posts were being ended (Nouri al-Maliki is one of the three -- or was). The article notes that Nouri cannot win the battle by depending on popularity. And that's a good call to make. In 2010, when he lost the election to Iraqiya, before Barack Obama and the Iranian government rescued him and insisted he get a second term, there was a long line of people opposed to him publicly -- this included the National Alliance (Shi'ite political bloc), Shi'ite cleric and movement leader Moqtada al-Sadr and the leadership of the Dawa political party. The article argues that Nouri will try to seize control by utilizing the support he has from various Shi'ite militia groups including the Badr brigade and the League of Righteous. Long before the Afghanistan-did-he-desert-was-he-captured melodrama, Barack had already negotiated with terrorists. The League of Righteous are terrorists. And Barack released their leadership from US military custody after he entered in a deal with them to release the 5 British citizens. The League was very public to the Iraqi press about the fact that they had a deal with the US government. They also went back on the deal for a period of time -- releasing only 1 living British citizen and the corpses of three, holding onto a forth corpse while insisting Barack hadn't lived up to all of his part of the deal. It's a deal the American people should have known about. To this day, the White House has never publicly been pressed to be honest about that deal or even to acknowledge it. But several White House friends -- including ______________ -- have insisted to me over the years that the US just released the terrorists from military custody and that didn't prevent Nouri al-Maliki, who was prime minister from 2006 to 2014, from prosecuting them for their crimes in Iraqi courts and that, the argument (or lie) goes, was what was supposed to happen. So, by that logic, Nouri's done a great deal for the League, he's kept them out of prison and out of the Iraqi courts. He also, when no political organization was supposed to have an active militia, brought them into the political process -- despite his knowing (as did everyone) that the League was nothing but an armed militia. They participate in politics now as a result of Nouri. So Qais al-Khazali is both a thug and a liar. Badr—founded in the 1980s in Iran, its continued supporter—is not only the most important of the various armed groups composing the Popular Mobilization Forces (Hashd). It also symbolizes how Iraqis’ hopes for a democratic country governed by the rule of law have given way to a political system that is expressly sectarian and increasingly resembles a garrison state. No other militia-political party was better prepared to capitalize on the collapse of Iraqi security forces in northern Iraq last June. Badr’s military commander, Ameri—who tried and failed to get an appointment as minister of defense or interior, in part due to U.S. opposition—has been transportation minister since Maliki’s second cabinet and is now a parliamentarian. Under the new government of Haider Al-Abadi, Ameri was able to get a member of his party, Mohammed Salem Al-Ghabban, confirmed as interior minister. Prior to leaving office, Maliki had made Ameri the military governor of Diyala—an informal appointment usually described euphemistically as al-masuul al-amani (the security official)—which he remains to this day. Where does Iraq go now? As the White House continues to insist bombing Iraq is liberating it, things don't look all that good. a. A call to hold extensive consultative meetings between the Iraqi powers that stand against the current political situation in Iraq, for the purpose of agreeing on and coordinating the principles and basics of the Inclusive Iraq Scheme and its activation. b. A call to convene a series of extensive seminars between the competent members and elites of the civil society, its active groups, its opinion leaders and social fronts, to bring closer the different points of views and reach perceptions that are as convergent as possible. c. A call on significant society groups, entities and titles to hold meetings, within their anticipated participation in any forthcoming collective Iraqi effort, and in support of and expansion of an Iraqi public opinion transforming into an active mass movement. d. A call to hold a public conference on the establishment of an inclusive Iraqi framework, under one title that regulates the ideas and thoughts of the aforementioned Iraqi powers. This is to be reached through a joint action charter based on the foundations of unity, independence of the Iraqi decision, rejection of near and distant foreign dependency and the enhancement of civil peace. This should stop any attempts to singly influence some powers dragging them towards individual concessions or into traps set here and there. This comes in preparation for a proper solution that can prevent Iraq from falling prey to deadly vacuum. We'll note more in tomorrow's snapshot. The renewed conflict in Iraq has resulted in a displacement crisis of an unprecedented scale. Over 3.2 million people have been forced into displacement since January 2014 alone. People are scattered in over 3000 locations across the country. This continues to present an enormous challenge for aid agencies trying to provide emergency and life-saving assistance to displaced populations. Many internally displaced persons (IDPs) are residing in hard to reach areas and are in desperate need of assistance and information about available services. “More than 3.2 million Iraqis have been internally displaced since the beginning of 2014 and we are simply not able to reach everyone due to the sheer size of the crisis. People continue to be on the move and many more are being displaced as we speak. While the call centre will help identify and respond to the most urgent needs of the displaced, it will also ensure that up-to-date information is available to them, so that they can access the assistance and services they require”, said Bruno Geddo, UNHCR Representative in Iraq. “This is particularly important for displaced people living outside formal camps and settlements, who may otherwise not be easy to reach to help them meet their needs and harness their resources”, Geddo concluded. The IDP Information Centre was established as a joint initiative of the Iraq Humanitarian Country Team in an effort to enhance two-way communication between displaced populations and aid agencies. IDPs and affected communities will be able to seek information about humanitarian aid, request assistance, and provide confidential feedback on the humanitarian agencies’ services and outreach activities. “First and foremost, the call centre serves as a quick and easy way for IDPs to find out about how the humanitarian community can help. But more importantly, it offers us a chance to connect to, and better understand, the people we serve,” said Jane Pearce, WFP Iraq Country Director. “Through the participation and feedback of IDPs in listening exercises and consultations, we are able to tailor the type of assistance we provide. The affected populations thus become stakeholders in the assistance process, and the humanitarian community more accountable to them”. Following a successful pilot in July 2015 in Erbil Governorate, the information centre is now operational across Iraq and can be reached via any Iraqi mobile phone by dialling 6999. “The IDP Information Centre represents a truly cooperative effort among humanitarian agencies”, said Kareem Elbayar, UNOPS Programme Manager. “UNOPS established and operates the information centre through the financial contributions of UNHCR, WFP, and OCHA; in-kind support has been provided by IOM. Most importantly, the information we give to callers is provided and regularly updated by dozens of NGOs and UN agencies working through the humanitarian cluster system in Iraq”. The IDP Information Centre is currently open from 8:30a – 5:30p Sunday through Thursday, but plans are in place to extend the working hours and add additional operators as needed. Iraq came up today at the State Dept press briefing moderated by spokesperson John Kirby. We'll note the section regarding northern Iraq, the Kurdistan Regional Government, where the issue of the presidency remains unresolved. QUESTION: Any updates on that Kurdish political parties meeting and U.S. involvement? MR KIRBY: So yesterday, the five main political parties in the Iraqi Kurdistan region met and decided to continue their discussions. We remain engaged with all the key stakeholders, the United States does. And as I said last week, this is, of course, an internal matter. And we’re – I’d refer you to the Kurdistan Regional Government for further information. QUESTION: So one point on this issue, and specifically on U.S. involvement. I’ve been monitoring the social media reaction by the people and also the Kurdish media, that they’ve seen the U.S. involvement is a negative one, is not in favor of democracy, is not in favor of representation law. Because what we have heard from the delegations, that – Kurdish parties’ representation in the meetings – that Ambassador McGurk, he is pressuring everyone to accept extension – President Barzani’s presidential extension for two more years as justifying with the ISIS issue or crisis or threat. And also this is, as you have mentioned before, this is the end of his term, and by law he’s not allowed to stay. And also it’s not an election that he’s suggesting. It is something – extension – which is not democratic, not according to the law. So can you confirm that this is what he suggested in the meeting? MR KIRBY: What I can confirm is that Ambassador McGurk was invited back to those meetings in Erbil after he had already left and went to Baghdad. We talked about this last week. He was asked back. And as I said last week, our role was simply to attend and to say what we have said all along, which is that we urge a unified, inclusive approach by all the political parties there, but that these were or these will be decisions that they make for the good of the people they represent. And any assertion that Brett McGurk or any other American delegate or any other American there in Iraq was putting undue pressure on the parties to do one thing or another is absolutely false. MR KIRBY: Ambassador McGurk was invited back. He didn’t go to Erbil to put pressure on any one party or for any one purpose. He was invited back, and so he went. And his message was that – what it has always been, which is that we want a unified approach by all the political parties to reach a consensus and to go forward so that they can best represent the people of the region. QUESTION: Last one on this. Do you believe – like, is it United States position that it is important that the Kurdish political parties to reach an agreement whether to stay – to allow President Barzani to stay as the president of Kurdistan in any way because of – you think that they – everybody should focus on the ISIS threat at the moment? MR KIRBY: We’ve said now is the time for unity in the face of a common enemy, and our focus is on defeating and degrading ISIL. And we want everybody to share that, obviously, same goal and to come together to unite against what is in fact a common enemy to all people living in Iraq. As for the solution that they come up with, again, these are internal matters for them to speak to, for them to decide, and for them to explain – not for the American Government to dictate, and we aren’t. MR KIRBY: I just meant a unified approach. Don’t read too much into it. I mean, we want them to take a unified approach forward to best represent the people of the region. Sunday, Margret Griffis (Antiwar.com) counted 188 violent deaths across Iraq. Lastly, Diana Ross broke barriers -- for all women and for men of color and, yes, for the gay community. She has been an inspiration to more people and in more ways than most could even list. Her concerts are communities where she welcomes and embraces all as part of the family of the world. As the leader of Motown's Supremes, she remade the cabaret circuit. TV? As Oprah Winfrey has often noted, when Diana, in all of her glamour, popped up on 60s television, it was an event since national television featured so few African-Americans. Lena Horne and Eartha Kitt are among those who preceded Diana and paved the way for her and others but both women were appealing to a mature (adult) audience. Diana Ross was a teen sensation. Motown was, as the slogan went, the sound of Young America. As someone with huge appeal to teenagers and pre-teens, she was presenting images of joy, strength and empowerment before many of the damaging racial stereotypes could take hold in the generation coming of age. At the height of the British Invasion, Diana and the Supremes held their own with dozens of hits that have remained a soundtrack of an era (12 of which went to number one on the pop charts). Diana went solo following her last number one with the Supremes ("Someday Will Be Together" -- a song which actually doesn't feature the vocals of the two other Supremes). She became a Vegas performer as important as Frank Sinatra or Cher. She continued to release hit records (5 solo number ones and one duet with Lionel Richie which went to number one) and also branched out into film and tele-films (Double Platinum, The Wiz, Mahogany, her Academy Award nominated performance in Lady Sings The Blues and her Golden Globe nominated performance in Out of Darkness). Her concerts are legendary and so is she. Sunday, community sites did theme posts about Diana: Mike offered "Mirror Mirror," Marcia went with "I'm Coming Out," Ruth chose "'Chain Reaction'," Stan shined a light "Workin' Overtime," Elaine again explored"Swept Away," Ann went with the more recent "Diana Ross' 'Not Over You Yet'," Kat noted Diana's first solo dance hit "'Love Hangover'," Rebecca went with "surrender" which is one of the many classics Ashford & Simpson (Valerie Simpson and the late Nick Ashford) wrote for Diana, Betty squeezed in as much as she could into an overview of "Diana Ross" and Trina kicked it back to the sixties with "Where Did Our Love Go." I try to note theme posts when the community does them. I wrote a bit more than I normally would. If that bothers someone who feels some other topic should have been covered, I'm waiving to you right now -- with the middle finger. And there are few western popular music artists -- male or female -- who have done as much as Diana has. There's also the background behind the posts. The immediate background is that Sunday Jim suggested we do a look at Diana's music at Third. Betty and I immediately said no. The posts were in response to that "no." Diana is a friend and my biggest regret online is the piece at Third that I believe savaged her music. Betty was in tears over the final article and I was steaming mad. That was years ago. Betty can speak for herself at her site (and probably will tonight) but I am still furious. And doing a piece that might or might not right that earlier piece from years ago? It could actually see me walking offline because I am still that furious all these years later. So never accuse me of playing favorites. I hated that article. There was no time to rewrite it, hours had been spent on it already. I was opposed to it. I noted I was but I didn't kill it. I didn't censor it. So never accuse me of playing favorites. But those posts were an attempt to rectify an earlier wrong (I believe it was a wrong) and I will write a wrap around that notes the amazing accomplishments of a dear friend.